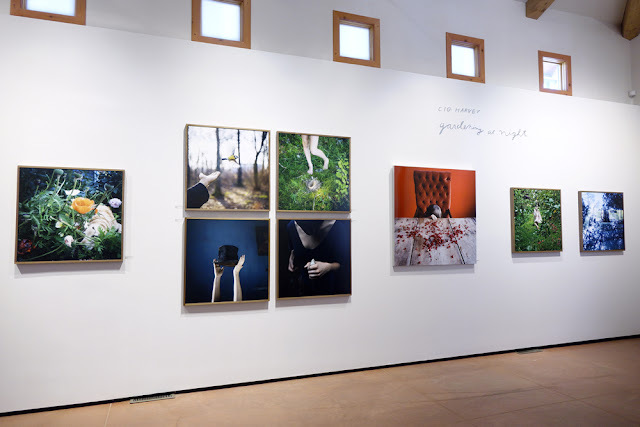 Interview Cig Harvey on making images for Gardening at Night We were delighted to host photographer Cig Harvey at the opening reception of her exhibition Gardening at Night, currently running through June 4th at photo-eye Gallery. After meeting the artist behind the marvelously colorful and spellbinding images, we were captivated. We were delighted to host photographer Cig Harvey at the opening reception of her exhibition Gardening at Night, currently running through June 4th at photo-eye Gallery. After meeting the artist behind the marvelously colorful and spellbinding images, we were captivated, not only by Harvey's fabulous style and charming personality but by her unwavering devotion to storytelling and photograph-making. Harvey believes photography is the “most powerful medium in the world,” a belief that is evident in the remarkable fascination her pictures evoke. Also central to Harvey's practice is the personal journey of making her photographs, which she beautifully discussed in a lecture for the School of Visual Arts. “Writing, journaling, mind mapping, …to make visual what's inside of us,” are all steps of her process and teaching methods, with the goal of "making pictures about things rather than of things." photo-eye’s Savannah Sakry asked Harvey to expand on a few points she made in the lecture, and for more insight into the photographs currently on view in the Gardening at Night exhibition at photo-eye Gallery. Savannah Sakry: You talk about the "magic of making" and how the act of making pictures is an extraordinary gift for you. 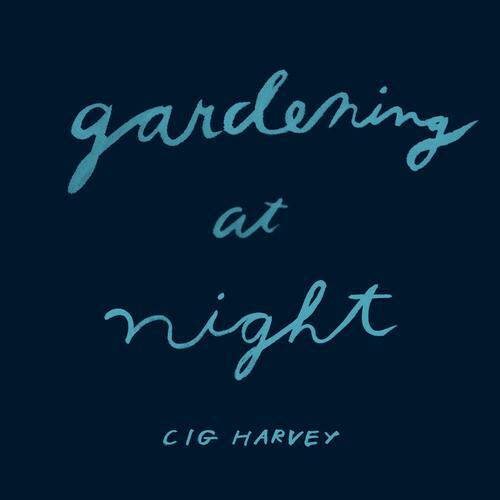 Are there images in Gardening at Night that are a good example of this? 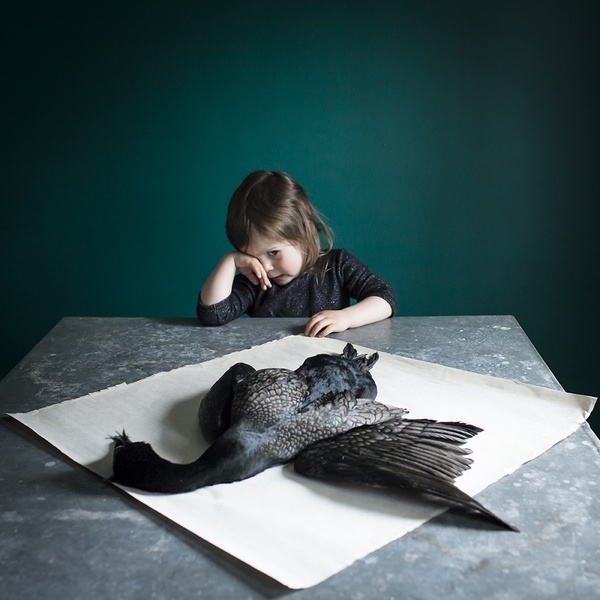 Cig Harvey: I am fascinated with the symbol of the bird in my work. I love the idea of migration: instinctively knowing your way home. My journals are filled with ways to photograph flight patterns, nests, eggs and feathers. I collect vintage birding books and birdcages. I've built birdhouses on stilts all over our land. The morning I made the Goldfinch image, I had been obsessively drawing birds over breakfast. I was constructing possible scenes but I wasn't sure exactly want I wanted. Perhaps I would photograph a tattoo of a partial bird on someone's skin. I asked everyone around me to draw me a bird, dreaming up ideas. Later that day, I found myself at a foggy park near the river. Suddenly, I was surrounded by goldfinches. It was magical. I could never have planned or constructed such a picture. It was a gift from the photo-pixies and a great reminder that I can’t always “think” up pictures. Sometimes I need to get outside with my camera and respond to the world. 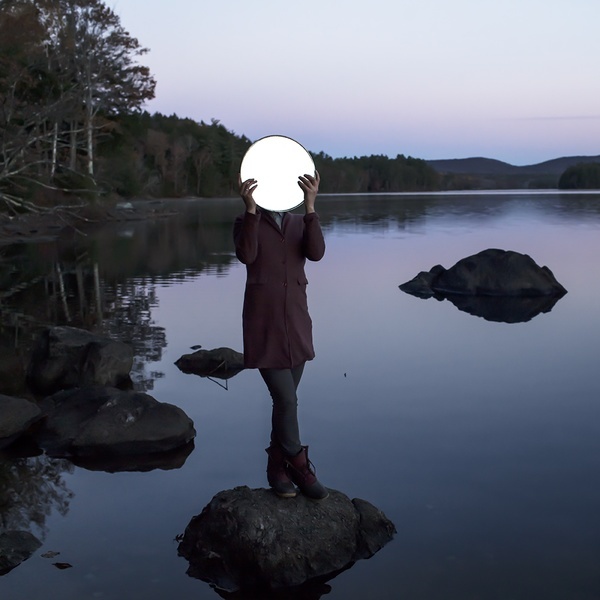 [For Sadie & the Moon], Sadie and I woke up at dawn and made the picture. It was late October and the lake was warmer than the air, which created an intoxicating lake mist. It was as if we had stepped into Narnia. I love that my camera sees things differently than my eyes and how that perspective can alter perception. Through light and selected depth of field, a round mirror became a moon. SS: I personally am very fond of the image Kendall at Beauchamp. Can you tell me more about it? CH: Sometimes people think that this image is constructed in Photoshop or a sandwiched negative, but it's just the magic of the camera's perspective. I used the camera as a device to play with the viewer's visual expectations, making a photograph that seems like an optical illusion. For me it is important that my images are made in my camera, in the real world. Photography reminds me again and again that the world is magical. I just need to be watchful and open to finding it. Although nature plays a sensory role in my images, my pictures are fundamentally about the business of being human. The landscape is often just a stage for the human experience. I am especially interested in the moment when a portrait becomes universal. I remember the moment when the forest reflected in the back window of the car and seemed to consume Kendall. It took my breath away. I moved an inch and it was gone. I love that about optics and photography. SS: You say "never say never" in photography. Can you give me an image as an example of this philosophy? 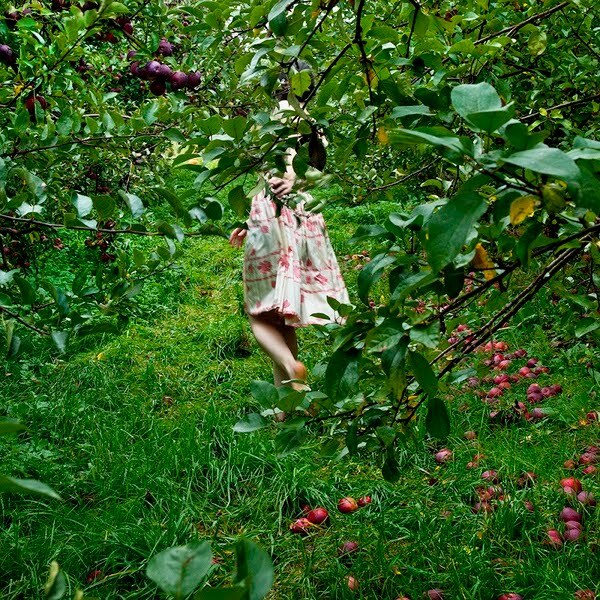 CH: I went to this orchard in September. I had just had a baby two months before and had been inside a lot. It was as if my world had been reduced to the 19 inches in front of me. As soon as I arrived at the orchard, I knew there was a picture waiting for me. There are many orchards near where I live, but none like this one. This one is wild and untended. It is not commercialized or kid friendly. There are no craft fairs on Saturday or cider samples or paper bags. On that day, it felt like Eden. Jewel toned apples, heavy on the trees and ground. Everywhere I pointed my camera showed abundance, that the Earth was enough. It felt like I had had never seen the color green before. SS: I like your advice of "You have to love your own work… You have to be in this game of photography for a lifetime to do anything more than scratch the surface.” Is there one image you LOVE? 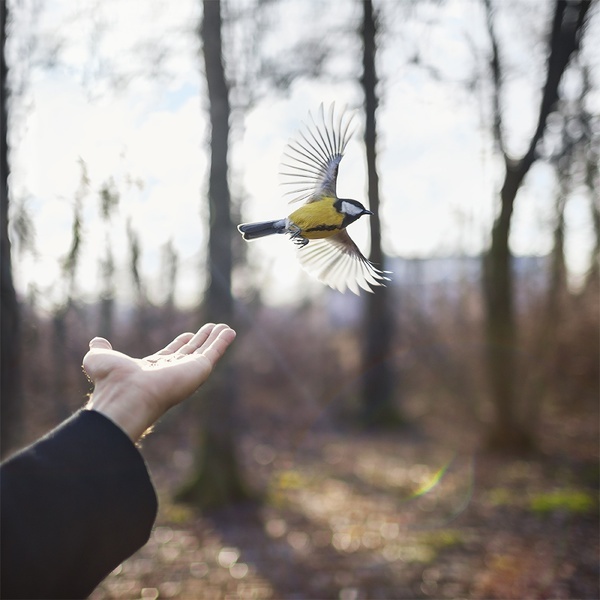 CH: I made the image [Scout & the Found Bird] at a challenging time creatively. Most days I think I have the best job in the world. But some days I struggle to find or create images. It was March in Maine, and we were still in the midst of a very long and difficult winter. I remember driving around just looking for something that moved me. I had no idea what I was searching for other than something that made me gasp. Days had past and I had made nothing. As I was driving over the bridge in Warren, this bird literarily just fell from the sky. I am not normally a collector of dead animals, but this was a sign and I had to respond. With outstretched arms, I picked her up and proceeded to photograph her for a few days before giving her back to the sea. I discovered that she was a Cormorant, and that they are often a symbol of good luck. I was in my studio making pictures of her when Scout came in. She put her finger to her lips and said, “shhhhhh, she is sleeping,” then mimicked the bird’s gestures. This moment moved me to tears, the empathy of a three year old. Fearful that I had not caught the moment on camera I asked Scout to do it again but she refused. She wanted to go and watch Dora, and so off she went. Gardening at Night runs through June 4th at photo-eye Gallery. Read the Pasatiempo article on the exhibition here.